August 26/27, 1994: A division of enemy troops was known to be in Pesaro and the area adjacent. The object of 205 Groups attack was to carry out "maximum harassing attacks" throughout the night on those troops. 37 Squadrons allotted time period over the target was from 2215 to 2315 hours with each aircraft remaining over the target area for a half hour. Illumination was to be individual - each aircraft illuminating and dropping independently on targets of opportunity. Eight 37 Squadron aircraft were detailed and operated. F/Sgt. MacIsaac took off from Tortorella at 2108 hours in Wellington Mk.X number LN798 "D" carrying nine 500 pound and seven 250 pound bombs. ETA over Pesaro was just under two hours. He dropped his bombs on suspected troop concentrations just north of the town area at 2308 hours from 8000 feet on a heading of 290 degrees. No results were immediately observable. Wellington "X" captained by Squadron Leader Forsyth strafed the area north-west of the town, also without observable result. In total, the Squadron dropped one 4000 pound bomb, sixty three 500 pound bombs, forty nine 250 pound bombs and fifty nine packets of nickels from altitudes of 5500 to 8500 feet in good weather. Six photos were plotted on correct headings in, or just to the west of, the prescribed area. Bombing was chiefly concentrated north and north-west of the town but results were difficult to assess. The Wing’s "best photo" was won by 37 Squadrons "V" piloted by F/Lt. Taylor. F/Sgt. 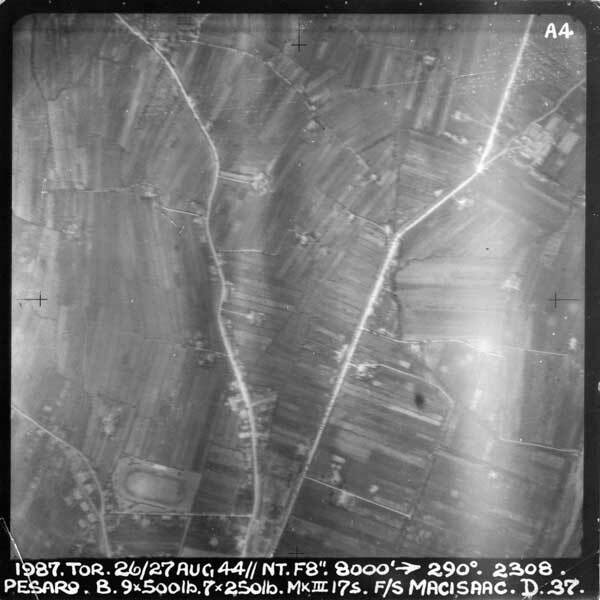 MacIsaacs aiming point photograph over Pesaro, August 26/27, 1944. Opposition was negligible and there were no losses. F/Sgt. MacIsaac touched down at Tortorella at 0104 hours.